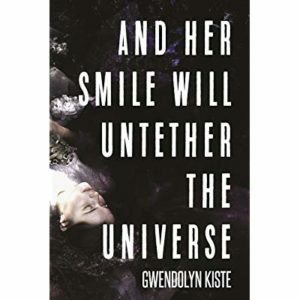 Gwendolyn Kiste is the author of The Rust Maidens, Pretty Marys All in a Row, and the Bram Stoker Award-nominated collection, And Her Smile Will Untether the Universe. Her short fiction has appeared in Nightmare, Shimmer, Black Static, and Interzone, among others. A native of Ohio, she currently lives on an abandoned horse farm outside of Pittsburgh with her husband, two cats, and not nearly enough ghosts. Find her online at gwendolynkiste.com. So, what do new readers need to know about Gwendolyn Kiste? I’m a horror and dark fantasy author based in Pennsylvania. 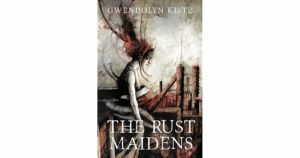 My debut novel, The Rust Maidens, was recently released through Trepidatio Publishing, an imprint of JournalStone. 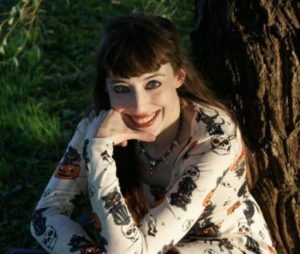 I have two previous books as well: a novella about the Marys of folklore called Pretty Marys All in a Row released by Broken Eye Books, and my Bram Stoker Award-nominated fiction collection, And Her Smile Will Untether the Universe, from JournalStone. What was the inspiration behind The Rust Maidens? While I live in Pennsylvania now, I’m originally from Ohio, and I went to undergrad in Cleveland, so I spent a lot of time in quintessential Rust Belt landscapes. Those are places I’ll always call home. Still, even though I love the area, I recognize how desolate and decrepit it can look. With the abandoned factories and the river that sometimes catches on fire, it can be a truly eerie locale. Leading up to writing the novel, I thought a lot about how there aren’t too many horror stories that use that urban decay of Cleveland and the Rust Belt, so it seemed like a perfect opportunity to explore it. Once I hit on the idea of combining the decay with body horror and coming of age, I was really excited to see where the story could go. Do fairy tales underpin much of your work, either overtly or covertly? I would certainly say that fairy tales underpin my work, both overtly and covertly. I’ve written a number of fairy tale retellings, but even some of my other stories have elements of myths, folklore, and fairy tales in them. The Rust Maidens, for instance, isn’t directly related to or inspired by any particular fairy tale, but I feel like there’s still overlap with the idea of a girl facing off against a kind of darkened forest—except in this case the proverbial “woods” is the urban decay of the Rust Belt. As I’ve been writing steadily and reading voraciously over the years, one thing in particular that’s surprised me is how the underlying Gothic elements of fairy tales are surprisingly malleable. You can do almost anything with them, and in some ways, that’s exactly what many writers have done. I would argue that since fairy tales are some of the earliest stories many of us hear or read, more authors’ work is influenced by fairy tales than probably any other source. So I suppose that many writers are influenced by fairy tales, though some might not even realize it! How did you connect with JournalStone? I connected with JournalStone through my now-editor Jess Landry. She contacted me back in September of 2016 when she first began seeking manuscripts as an editor. It wasn’t even really on my radar yet to put together a collection, although a couple writer friends had encouraged me to do just that. However, when Jess said that she was specifically looking for collections, I decided that it was too perfect of an opportunity to pass up, so I went through my short fiction to see what stories would fit together. From there, everything came together in a whirlwind for what ultimately became my debut collection, And Her Smile Will Untether the Universe. Part of me didn’t know what to expect from the whole process, but I was thrilled at how much fun it was working with Jess on the book. After that release, it became an easy choice to go with JournalStone for my first novel. Tell us about the cover art from the amazing Daniele Serra! I love that cover art so much that I could probably talk about it all day! Jess suggested Daniele for the cover, and right from the start, I was really excited at the possibility. I of course knew his previous work, and I love his beautiful, evocative style. Still, until details are confirmed, I try never to get my hopes up too much, because there’s always a chance that an artist won’t ultimately be able to do a cover. There are so many factors at play with everyone’s different timelines and schedules. So when I found out he was interested and then saw the initial mockup for the cover, it was absolutely thrilling. The way he created the factory in the background and the Rust Maiden standing in the foreground completely captures the lonesomeness and decay of the novel. Even the colors match the palate of the story. It was a perfect fit, and I feel so fortunate that it worked out so well. I can’t imagine The Rust Maidens with any other cover. In general, who and/or what are your writing influences? My usual answer to writing influences include Ray Bradbury, Shirley Jackson, and Angela Carter. Those are three of the biggest for me, but for the sake of not always repeating myself, I’ll add Sylvia Plath, Richard Matheson, and Mary Shelley. Also, Charlotte Perkins Gilman’s “The Yellow Wallpaper” was a truly pivotal work for me as both a reader and a writer; it helped me see just what the horror genre can do, even in seemingly austere settings like that story’s time period. As for newer authors, I absolutely love Brooke Warra, Eden Royce, Sara Tantlinger, Christa Carmen, Christina Sng, Anya Martin, Kristi DeMeester, and Stephanie M. Wytovich. I would highly recommend that if anyone hasn’t read their work yet, then check them out very soon! Probably around the age of six or seven. That was the point while reading a book, I first realized that I could be a storyteller too. It seems like that’s a common experience among writers, that we all had that initial moment, usually while reading a book we really loved, that inspired us to consider becoming authors someday ourselves. Who is your favourite villain in fiction? This is a fabulous question! There are so many great villains that it’s really hard to choose, but I’m going to opt for an offbeat pick and go with the eponymous bird in Poe’s “The Raven.” It’s one thing to deal with a villain who has elaborate designs to amass power. But a villain like the Raven who just sits near you day after day, reminding you of all you’ve lost, so single-minded with no clear motive except to torture you—that’s truly terrifying and devastating in a way that someone like Moriarty or Captain Hook could never come close to touching. The Raven can also be seen so much as a parable for grief or depression, and I think many of us can agree that those are two of the worst real-life villains we have to face, which only makes Poe’s poem that much more effective, even after all these years. On a related side note, I only recently learned that “The Raven” was based in part on Charles Dickens’ pet corvid named Grip. After spending a lifetime pecking at Dickens’ children and apparently being one very surly bird, the little devil was eventually taxidermied and relocated to Philadelphia. Sometime soon, it is a major goal of mine to go face this villainous creature myself and hopefully get some pictures with Grip. Because truly, she’s a horror celebrity if ever there was one! Who is your favourite heroine/hero in fiction? Jane Eyre. Ever since I first saw the Joan Fontaine film adaptation, I’ve adored and admired that character so much. I love how in many ways she’s radically ahead of her times, ultimately self-sufficient before she returns to Thornfield Hall at the end. How strongly she feels love but also the power of her convictions stand at once in such total juxtaposition and complete harmony with one another. Plus, the Gothic elements of the novel have always made me refer to it as being so close to a horror story that it practically counts as genre. What is next for Gwendolyn Kiste? Right now, I’m back to work on short fiction as well as outlining a new novel and a novelette. I’ve got a huge number of goals for 2019, but I tend to start out with really grand, whimsical plans in January, only to face a more reasonable reality by early spring. So we shall see where it all ends up! I’m also planning to attend some writing events in 2019. I’ll be a guest at The Outer Dark Symposium in Atlanta in March, and I’ll also be at StokerCon in Grand Rapids in May. It’s always so much fun to get away from the computer for a bit and hang out with readers and writers. It helps to energize me for all those days spent alone in front of a screen. This entry was posted in Uncategorized and tagged And Her Smile Will Untether the Universe, Anya Martin, Brooke Warra, Christa Carmen, Christina Sng, Eden Royce, Edgar Allan Poe, Gwendolyn Kiste, jane eyre, JournalStone, Kristi DeMeester, Richard Matheson, Sara Tantlinger, Stephanie M. Wytovich, Sylvia Plath, The Rust Maidens. Bookmark the permalink.